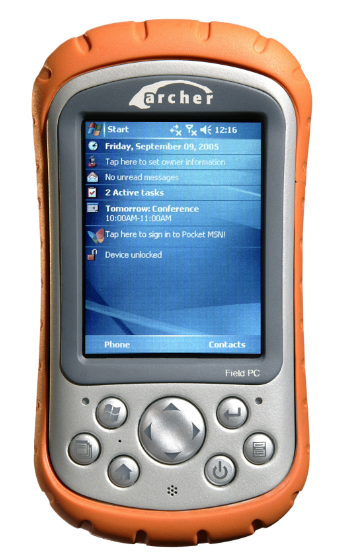 Most field computer customers purchase a handheld with a single use planned and implemented, and usually customers determine the application long before they purchase the device. However, once the device is deployed and the field workforce is carrying it every day, it makes sense to utilize more of the handheld’s multi-use capability and increase its value to the business. Customers often consider adding additional applications like basic mapping, time and work management, or messaging to their field workflow. Windows® Embedded Handheld (previously Windows Mobile, Pocket PC, etc.) 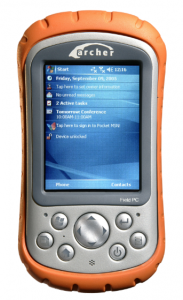 and other Windows CE-based operating systems have a long history of use in field computing. Over the years, these Windows operating systems have been used in business and consumer devices, from gas pumps to mobile phones. Alongside these devices, a marketplace in which developers could sell their platform-specific applications emerged. Eventually, Microsoft’s use of these operating systems for smart phones was discontinued and it transitioned to the Windows Phone operating system in 2011. As the consumer mobile device industry exploded in size, powerhouses Google, Apple, and Amazon began selling apps directly from devices. Many online application stores began to focus only on the consumer operating systems and Microsoft finally shuttered the Windows Mobile online store in 2012 in favor of a store based on the new Windows Phone operating system. For industry, however, Windows Embedded Handheld and Windows Mobile devices continue to sell at a growing pace and the operating system continues to be developed and improved. New devices—everything from point-of-sale systems to rugged field computers—are surfacing as well. So where does a business get an app for these devices? Handmark – On this site, I found a useful application that will use a device’s camera to make a PDF of a document. In some instances you will have to choose a consumer device that closely matches the operating system. By far though, the most important source for industrial and business applications has been, and remains, the software vendor. The ISV (Independent Software Vendor) community for Windows Embedded applications is very active. Smart phones and consumer tablets may have branched off into their own world of applications and marketplaces and created massive industries of their own, yet the industrial and field computing markets continue to produce solutions tailored for the field worker. While you may not be able to find Pandora or Angry Birds for your Mesa® Rugged Notepad, there are many companies that produce solutions for your workforce, should you decide to add additional functionality to your rugged handheld. To learn more about Juniper Systems rugged handhelds, send us an email or give us a call at 435.753.1881. What other sources have you found for Windows Embedded Handheld applications? Share with us in the comments below. Excellent post, and the listed sources for Windows CE/Windows Mobile apps and development are very valuable. Many of those sources have years and years of experience and know those software platforms inside out (I’d probably add BSQUARE as well). Overall, it’s a very peculiar situation where the vast majority of all those hundreds of millions of smartphones run either Android or iOS, whereas virtually all vertical market handheld devices continue to run one version of Windows CE, Windows Mobile or Embedded handheld or another. Going forward, it’ll be interesting to see how it all plays out. Hi Conrad, thanks for adding another source for apps to our list. I am also very curious to see what direction the field computing market will take with regards to operating systems. I guess only time will tell! I like many others have looked into useful apps for the Mesa Rugged Tablet. I personally like OMarket, that contains many of the Windows 6.5, PocketPC apps that have been around for a while. There even is an older Pandora app that I got to work, nice for those of us in the field who also enjoy music. Thanks for this post, those are very good references for developers. I am interested to see how the Rampage6 with Android OS plays out as well. We made the decision to go with the Mesa and Windows Embedded because of familarity and ease of workflow with our current setup. I will definitely have to check out OMarket; thanks for the suggestion. That’s great that you found a version of Pandora to work on the Mesa! I suppose I’ll have to eat my words now. I was looking for an application that would let me use Windows embedded handheld as a display for some basic temperature logger. Then it would preferably let me send the data to database for a web based UI. Ideally I would use USB connection for data transfer from the logger to the handheld. BT is the second best option. I know the post is from 2013, but I thought I’ll give it a go. We know of several applications that could work and customers that have successfully managed similar field data collection. Data can be transferred via USB, RS232 serial, or Bluetooth and the recommended software application would depend on your database type/needs. We recommend contacting our service support experts at support@junipersys.com OR calling 435-753-1881 and speaking to a technical support representative. Hope this helps! Let us know if you have any other questions.